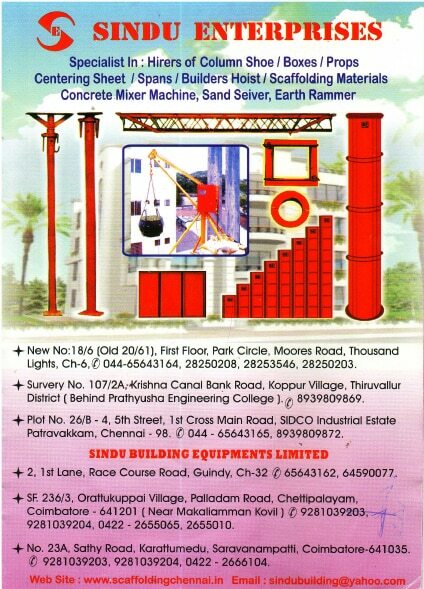 We are one of the finest construction material hiring company Column Boxes have different sizes. Our highly reliable and durable Column Boxes are used to cast concrete columns.having L column boxes, Round column boxes, Square column boxes & Column shoes , Round shoes. COLUMN BOX: A column that carries the load down to a foundation must have means to transfer the load without overstressing the foundation material. Reinforced concrete and masonry columns are generally built directly on top of concrete foundations. When seated on a concrete foundation, a steel column must have a base plate to spread the load over a larger area, and thereby reduce the bearing pressure. The base plate is a thick, rectangular steel plate usually welded to the bottom end of the column.